Where Did All the “GOOD” Lawyers Go? In the last couple of years I’ve noticed the trend among many Personal Injury Lawyers is to take on a Personal Injury case they know they can’t handle and if they can’t settle, they send it out to another attorney to handle the litigation and trial. What that means is that if you were seriously injured and you hire a Personal Injury attorney the likelihood is probably about 95% that your present attorney won’t handle your case if he can’t settle it. You will have a second attorney to file your lawsuit and prepare for trial. It’s a sad state of affairs when your Personal Injury Lawyer doesn’t have either the skill or experience to handle litigation and trial. Both my partner Silvio Natale and I had a “life before law”. Silvio’s father and brothers were all in the cement business and his father was a contractor. I personally spent nine years in construction, eventually reaching the level of journeyman carpenter. My first job after graduating from San Diego State was as Assistant Registrar at the University of California at San Diego. Later, I became a Foreign Service Officer in the United States State Department stationed in Washington D.C.. When I realized that my destiny was probably going to be living on the East Coast or assigned to some foreign country, I decided to turn in my resignation. I moved back to Los Angeles and I began law school. My internship was with an InsuranceDefense firm that represented about 12 different insurance companies and I became managing Partner. The benefit of having interned at an Insurance Defense firm, as you might expect, was invaluable training for a new attorney and caused me to really learn the business of how insurance companies work. Unfortunately today, new lawyers graduating from law school hang up their shingle and begin practicing law without experience, skill, or even a mentor. We pity their poor clients these Attorneys represent. I’m guessing, but you probably have a a 95% chance of inadvertently having one of these lawyers represent you. The quality of their legal work is horrible. Most of the time we can unravel the problems and breathe life back into the corpse but sometimes the damage is fatal and it’s way too late for the client. Yes, that was 32 years ago when I started out in a Personal Injury law firm, and Silvio has no less than 28 years of developing his trial skills. Personally, I learn something new every day. If you are a prospective new client and want “The Best” skilled representation, find an attorney that specializes in serious personal injury cases, one who has and has a reputation for Personal Injury litigation and trials, not somebody who just settles cases. 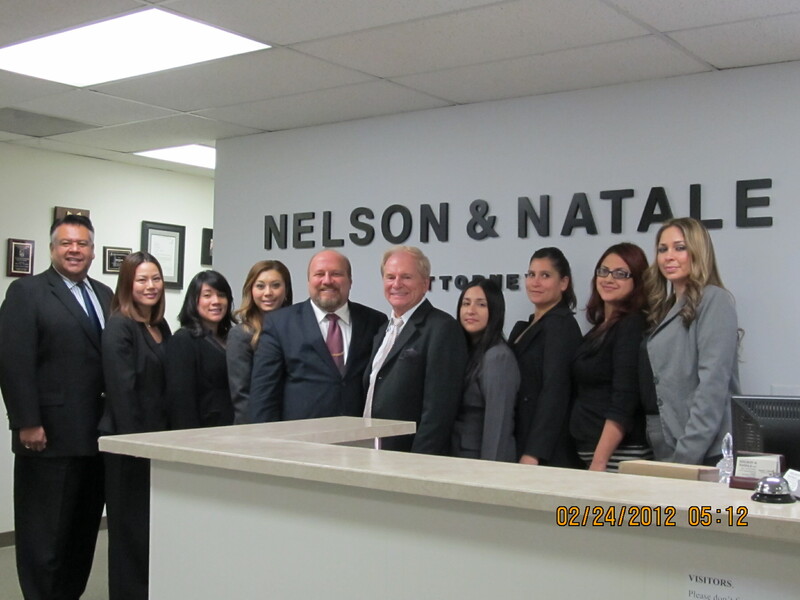 Nelson and Natale is a moderately sized firm with 15 highly trained staff, the newest of whom has no less than eight years of legal experience. If you have been seriously injured, find a law firm that will be able to take your case all the way to trial, if necessary. YOU CAN CONTACT US BY CALLING (310) 641-8300. DO IT NOW!